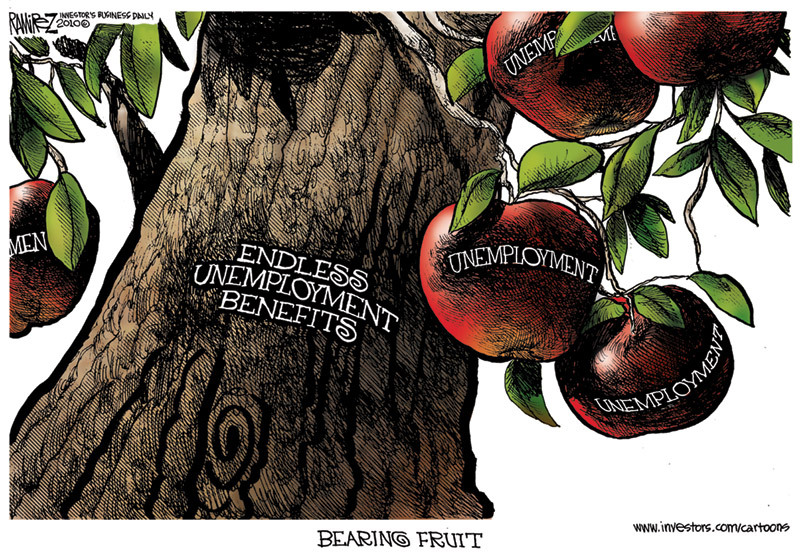 « Why Do Democrats (and Republicans) Want More Unemployment? Who Needs Krugman, Summers, and the San Francisco Fed When You Have a Ramirez Cartoon? I don’t now why I bothered spending all that time perusing the writings of Paul Krugman and Larry Summers in order to produce my previous blog post when this Michael Ramirez cartoon makes the same point in a much simpler way. people often forget about your next door neighbor, or the hardworking americans all across the country, that QUALIFY through an arduous process for unemployment benefits, the chief qualification is that they are out of work THROUGH NO FAULT OF THEIR OWN. These people are required to submit sufficient work search requirements, and 1.3 million Americans have not been able to find full time work in the alloted time available for benefits. This is a few years after the WORST ECONOMIC CONDITIONS IN EIGHTY YEARS. These people do not go on vacations with this money, with an average of $300 a week, it is literally spent before they receive it, through payments to rent, groceries, and other necessities of LIFE. The consequence of having lost your job through no fault of your own, is the result of reckless banker’s bets on risky mortgages. The people we are talking about, are the ones holding the bag at the end of it all. And what we are talking about here is congress lifting up their arm, and signing a piece of paper – so that Americans can have a warm place to sleep, and a meal. That is all. What happens to a tree like this in a Greece Fire? Obama knows what he is doing. He won’t learn anything from anyone trying to teach him how to improve our economic situation. He wants to DESTROY our economy! When America collapses, then his militia will take over, he’ll become the supreme dictator, all our freedoms will be gone, and his Marxist dream will become a reality.